Join Richard for fishing, fun and excitement. He will make the pursuit of the largemouth bass an experience you'll want to repeat...and repeat. 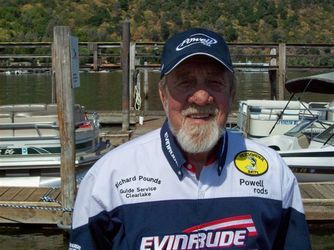 For a great fishing experience Richard will share his knowledge and experience with both novice and advanced anglers on beautiful Clear Lake!!!! Averaging 200 guide trips per year! 25 years fishing experience on Clear Lake. Richard Promotes and Practices Catch & Release Richard provides Top Quality Equipment! For 2008, the fishing was a little slower than the past few years however it was a good year for 10 plus pounders. It went like this: 81 bass over 5 pounds, 31 over 6 pounds, 21 over 7 pounds, 2 over 8 pounds, 7 over 9 pounds and 6 over 10 pounds.